President Xi Jinping on Wednesday held talks with Ecuadorean President Lenin Moreno at the Great Hall of the People in Beijing, calling for the healthy and steady development of the bilateral ties. 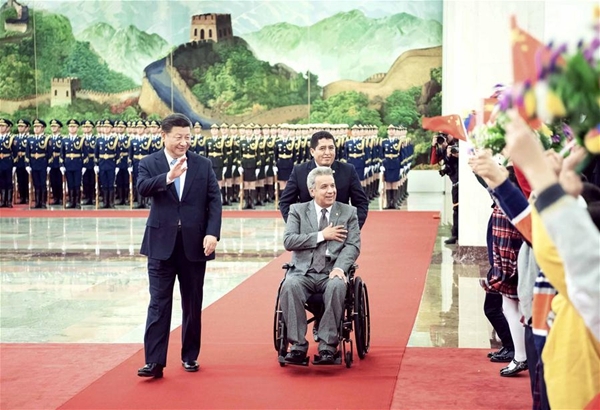 Recalling his state visit to the South American country in 2016, Xi said the healthy and steady development of China-Ecuador ties goes with not only the fundamental interests of the two countries and peoples but also the trend of peace, development and win-win cooperation. During the 2016 visit, the two countries established a comprehensive strategic partnership, ushering in a new chapter for the bilateral relationship, Xi said. Xi said he appreciates President Moreno's commitment to deepening the friendly cooperation between the two countries since Moreno took office last year. Xi stressed that the two sides should increase interactions to intensify their strategic communication and coordination and exchange experience on governance, so as to enhance mutual understanding and support for each other's path of development and continue backing each other firmly on issues involving their core interests and major concerns. Noting that Ecuador's participation in the construction of the Belt and Road is welcomed by the Chinese side, Xi expects the two sides to jointly promote cooperation in areas such as infrastructure, production capacity, agriculture, information technology, new energy and environmental protection. "China welcomes Ecuador to actively explore the Chinese market and share opportunities brought by China's development," Xi said. China's financing cooperation with Ecuador is conducted on the basis of equality, mutual benefit and business principles, without attaching any political condition, said Xi. Noting that the Chinese government requires Chinese enterprises in Ecuador to abide by local laws and regulations and run business fairly in the market, Xi expects the Ecuador side to create a good investment environment and protect their legitimate rights and interests. He called for closer people-to-people and technology exchanges, urging both sides to carry out law enforcement cooperation to guarantee normal exchanges of personnel, economy and trade. Xi also said China will continue to support Ecuador's post-earthquake reconstruction and its disaster prevention work. China and Ecuador have same or similar positions on major international and regional issues, said Xi, calling on the two sides to collaborate closely to safeguard multilateralism, promote reform of the global governance system and defend the legitimate rights and interests of developing countries. Moreno expressed gratitude for China's assistance on Ecuador's economic and social development, especially for the help offered after Ecuador was hit by an earthquake in 2016. Moreno said Ecuador is ready to actively take part in the Belt and Road Initiative and expand bilateral cooperation in various fields. He welcomed and appreciated China's financing cooperation with Ecuador and expects to expand exports to China. Moreno also expressed the will to enhance coordination and collaboration with China in multilateral affairs such as UN Sustainable Development Goals. After the talks, the two leaders witnessed the signing of several cooperation documents, including a memorandum of understanding on jointly promoting the construction of the Belt and Road.